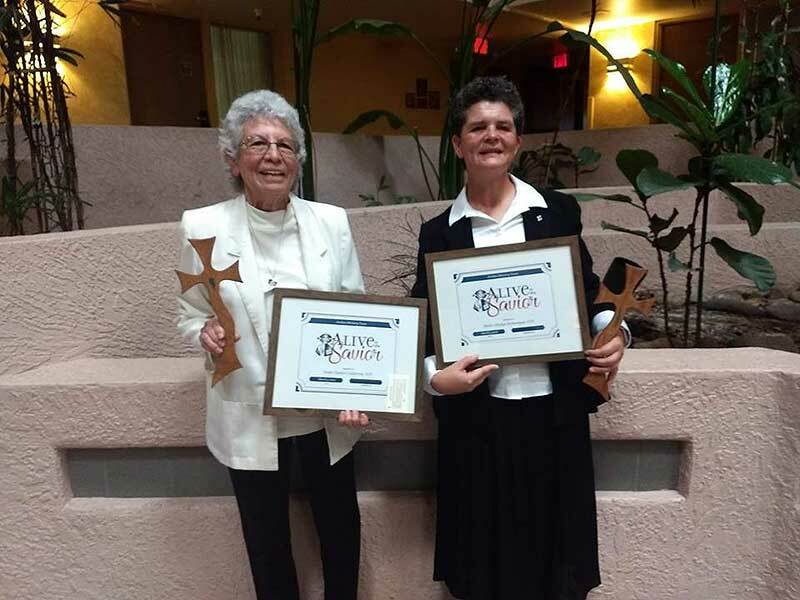 Dominican Sister of Peace Sister Esther Calderon, left, receives the Jordan Ministries “Alive in the Savior” Award on March 3, 2019. She is shown here with her co-awardee, Sr. Gladys Echenique, Dominican Sisters of Oakford, right. Tucson, AZ – Dominican Sister of Peace Sr. Esther Calderon has devoted her entire religious life to the pillars of Dominican Life – prayer, study, service and community. Her dedication was recognized earlier this month when she was honored with the Alive in the Savior Award at a dinner and ceremony by the Jordan Ministry in Tucson, AZ on Sunday, March 3, 2019. Originally from Arizona, Sr. Esther spent much of her professional life in the healthcare service in Louisiana, Idaho, and Colorado before her ministry drew her to Tucson. She was a home health nurse, a Tucson Parish Nurse, a hospice home care nurse, at Carondelet Hospital in Tucson, and also enjoyed life and ministry with Tohono O’odham Nation, working at Sells Indian Hospital west of Tucson. More than offering care for the body, Sr. Esther ministered to weary souls and broken spirits, offering peace and comfort with every visit. During her nursing career, Sr. Esther was also active in prison ministry, and served as an educator for Spanish-speaking deacons and catechists in the Tucson diocese. Although she retired in 2017, Sr. Esther continues to serve the people of God and her diocese. Her ministry of prayer now includes house calls to the sick of the parish, bringing communion to those who are home bound, and remains active in her prison ministry. She also offers comfort to families suffering medical trauma in local hospitals, praying with the families and assisting how she can. Tucson’s proximity to the border has also opened a new ministry for Sr. Esther. She serves as a volunteer at Casa Alitas, a diocesan shelter for migrants released by ICE, and at the Eloy ICS Detention Center in Eloy, AZ. Sr. Esther is also involved in No More Deaths, a humanitarian organization dedicated to increasing effort to stop the deaths of migrants in the desert and to achieving the enactment of a set of Faith-Based Principles for Immigration Reform.